Hello! This is the last of the Tropical Blooms flowers that I watercolored and embossed. I love to be able to use up extra things or scraps. I am keeping it a red, white and blue theme for Summer's 4th of July celebration. I started by creating a tag and freehand cut it to the size I need. 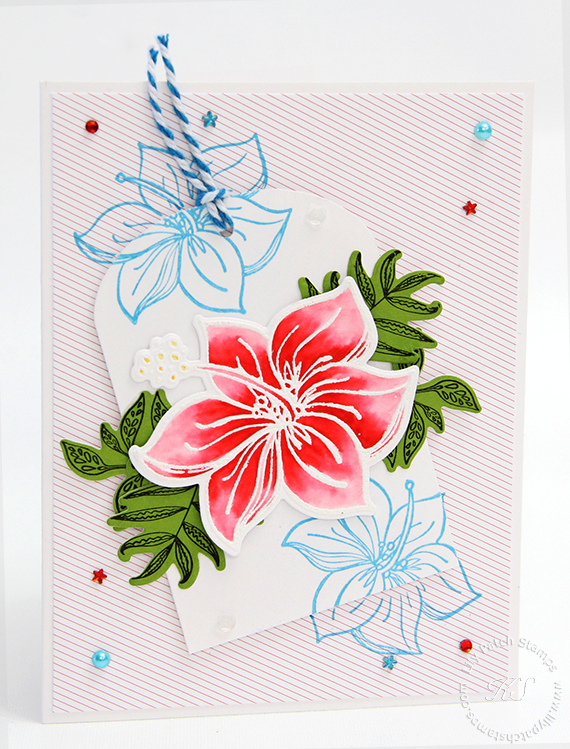 I then stamped the small hibiscus in blue right onto of the tag and the pinstriped patterned paper. I used 3d tape to pop up the tag. I stamped and die cut the greeneries to place it behind the large hibiscus. The last thing to do was add some twine and embellishments. Such a beautiful card! Love your colors. Thanks for sharing at ATCAS! SO gorgeous! I love the variation of colors for the blooms and the tag design is so creative! Thanks so much for playing Simon Says Stamp Wednesday “Add Some Shimmer” Challenge! Well done! A beautiful floral inspired creation and perfect for our theme, thanks so much for joining in at Allsorts challenge this week. What a lovely technique! Thank you for participating in our challenge at Allsorts this week. Wow Kim, what a stunning creation. I love the bright colours you've chosen, they give me a sunny feeling. 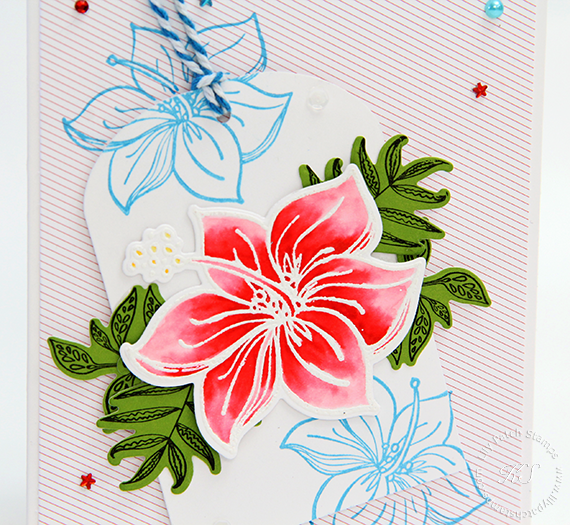 I love how you stamped and colored your tropical flowers, and your design is stunning! Thanks so much for playing along with us this week at Addicted to CAS! A gorgeous card. Thank you for joining us for our “Summer” challenge at Di’s Digi Designs. Hope to see you again.